I’ve been a gardener for a long time, and I love it. But I’m as busy as the next person, and sometimes I just want a quick way to get the job done. I’m not looking to cut corners – I want it done correctly, you understand – I just want to be more efficient. 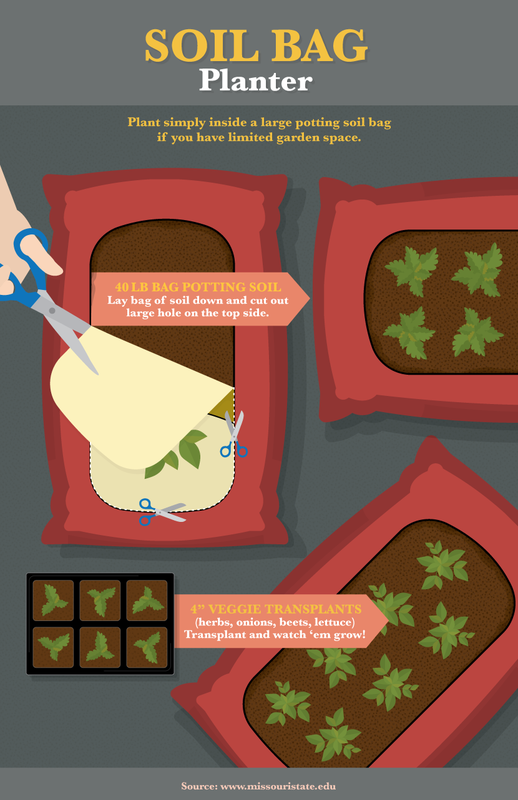 If you find yourself in the same situation, here are five genius garden hacks to save you a bit of time. Now you can spend that time on garden activities that you actually want to savor, and not feel guilty that you’re not tending to the minutia. Any tool with a blade will need regular maintenance to keep it sharp – a dull blade not only will not do its job, but it presents an injury hazard to the user. Sometimes it’s necessary to take the tool apart to do some major cleaning and sharpening, but for day-to-day maintenance and storage all rolled into one, the sand and oil mixture is a good option. With some ordinary materials and supplies, your hand tools can be cleaned and stored simultaneously. 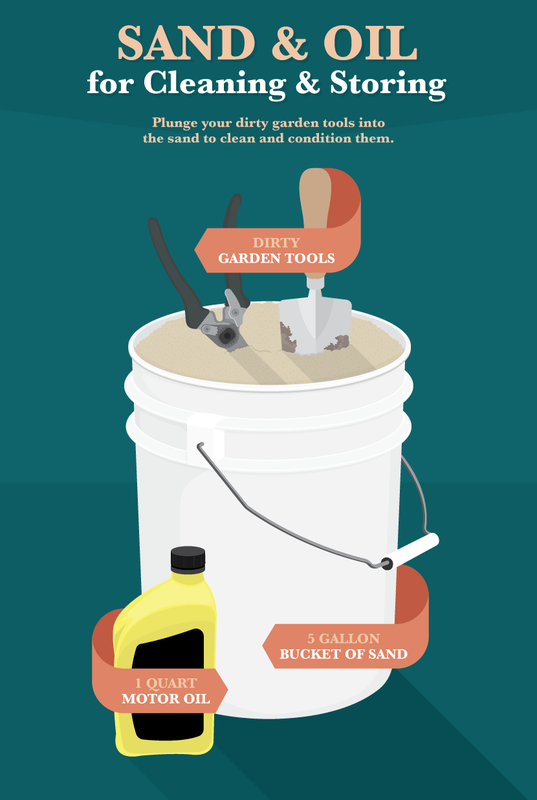 Take a 5-gallon plastic bucket (available at home improvement stores) and fill it ¾ of the way with sand. Then take a quart of motor oil, mineral oil, or even vegetable oil and pour it into the bucket so that the sand is damp – it should not be moist or have a wet appearance. Now take a tool (pruners, shovel, loppers, knife, etc.) and plunge it into the mixture. The blade of the tool will cut repeatedly into the sand, which will remove grime, dirt and rust, while also conditioning the blade. After using a tool, plunge it several times into the mixture and leave it there until you need it again. This cuts down on your overall tool maintenance, saving you time. We all have those container plants that need consistent watering, and the ones on your deck or patio are the biggest water guzzlers of all. But few people really like to get out every day to water them, and when you leave for a weekend trip, you always worry that your plants will greet you with a gasp for more water when you return. 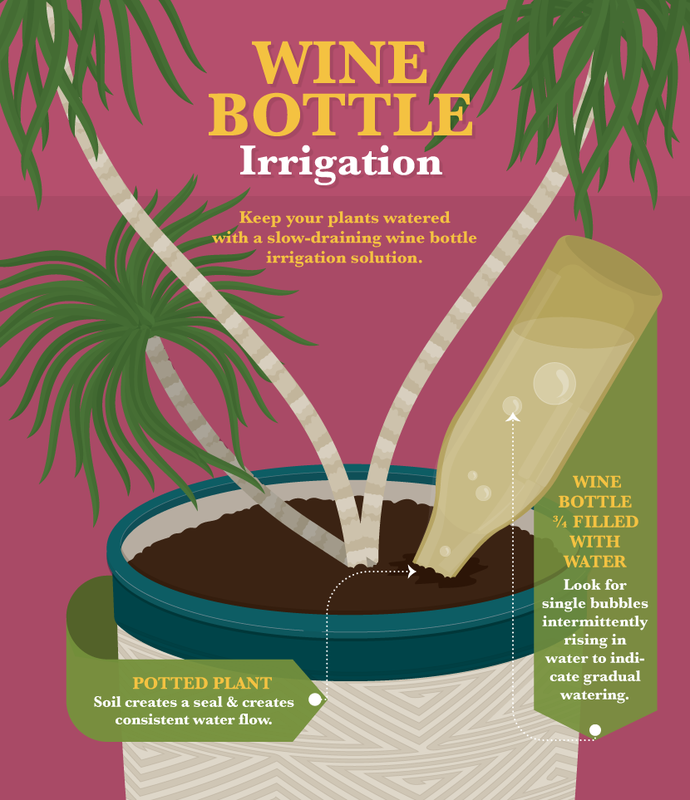 To water your container plantings consistently without being a slave to the watering can or hose, simply use an empty wine bottle. Fill it about ¾ full of water and, carefully overturning it, plunge the neck of the bottle into the soil of your container plant. This “water bottle” will release water slowly into the soil as the soil can absorb it. As a bonus, mix in some water-soluble fertilizer so you can water and feed at all once. Container plants that enjoy this type of supplemental watering are ferns, tropical plants, annuals, and flowering perennials. Plants with low water requirements like cacti and succulents should not be treated to this type of watering, as rotting is always an issue. Many of us have those spots in our gardens where we like to plant annual color like salvias, petunias, pansies, and snapdragons. The problem is that we hate digging all those holes when it’s time to change the color out with the seasons, don’t we? Try doing the work once and then enjoying the benefits all year long. This tip works best if you typically use the same size pots in a particular place in your garden every season. Most annuals come in 4” pots, quarts, or 1-gallon containers. Dig all the holes for your plants, but dig them the exact size of your plastic nursery container (same width and depth). Now simply drop the planted nursery container into the hole and finish by mulching around it to disguise the plastic planter. At the end of the season, lift out the spent plants in their containers, and drop new containers with fresh plants into the holes. If you are worried about drainage, nursery pots always have about four drainage holes along the bottom of the container – but if you’d like a little more drainage for the particular plant you are using, simply cut off and dispose of the bottom of the pot. Now your plant’s roots can spread out, allowing water to pass through. Isn’t it frustrating when you go out to your garden and see invisible enemies chomping on your cabbage leaves? 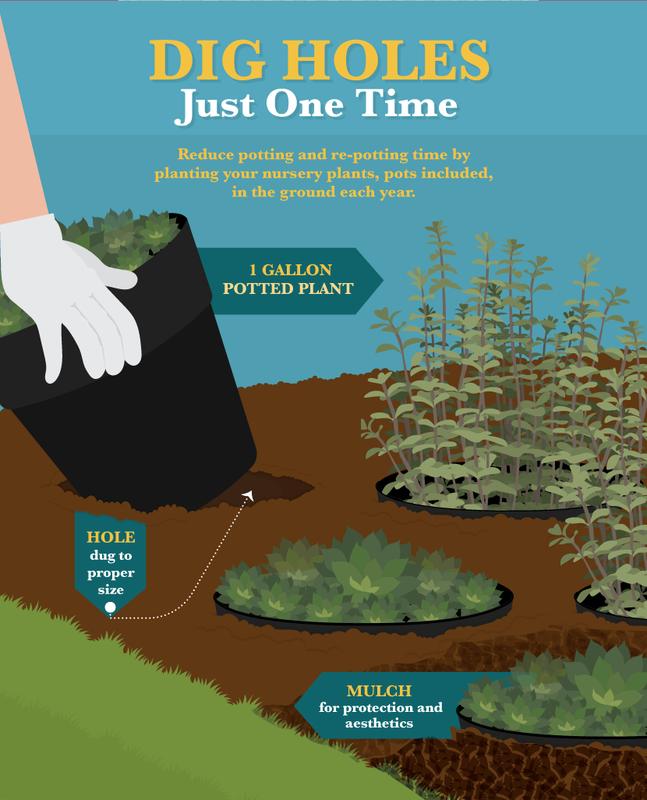 Regular garden maintenance is a necessity if you want to have healthy plants, but there are things you can do to cut down on those chores. Like the Buddy System, for example. Remember when you were in third grade and your class went on a field trip to the zoo? You were assigned a buddy so you would stay safe and not get lost. The same principle applies to gardening. 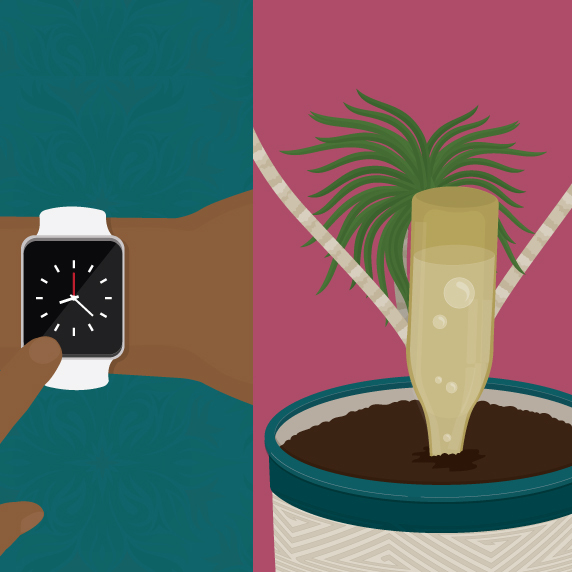 You can buddy up certain plants to help both of them thrive. Plant marigolds around the perimeter of your vegetable garden to repel unwanted bugs. Plant vining beans next to corn, and the corn will act as a natural trellis. Practice crop rotation so that valuable nutrients are replaced by particular plants for other plants that need them. Plant basil near tomatoes and lettuce to improve flavor and repel mosquitos. If you have poor soil, don’t want to prepare an area for a vegetable garden, or are short on space, no worries. A bag of good quality potting soil and some small vegetable transplants will do the trick to keep you in leafy greens. Start with a large bag of potting or garden soil – look for 40-pound bags at your garden center or home improvement store. Lay the bag down where it’s going to stay for the season, because after it’s planted it will be nearly impossible to move easily. Using a large utility knife, cut out a rectangle on the top surface of the bag. Leave 2” around the top surface, so that the rectangle looks like a picture frame – this will help to retain the soil in the bag. Using your utility knife, plunge additional holes for drainage through the soil and the bottom surface of the bag. Now it’s time to plant. Choose vegetables like potatoes, onions, beets, lettuce, and peas, or nearly any herb. Remove them from their nursery pots, gently loosen the roots, and plant them right into the soil in the bag. Remember to use the suggested spacing for each type of plant you are using. Water regularly and then enjoy your harvest! Bonus points if you choose bagged soil with additional fertilizer – now you have an instant fertilized planting medium ready to go!